It is easy to think that patient-centered care all takes place in the exam room. 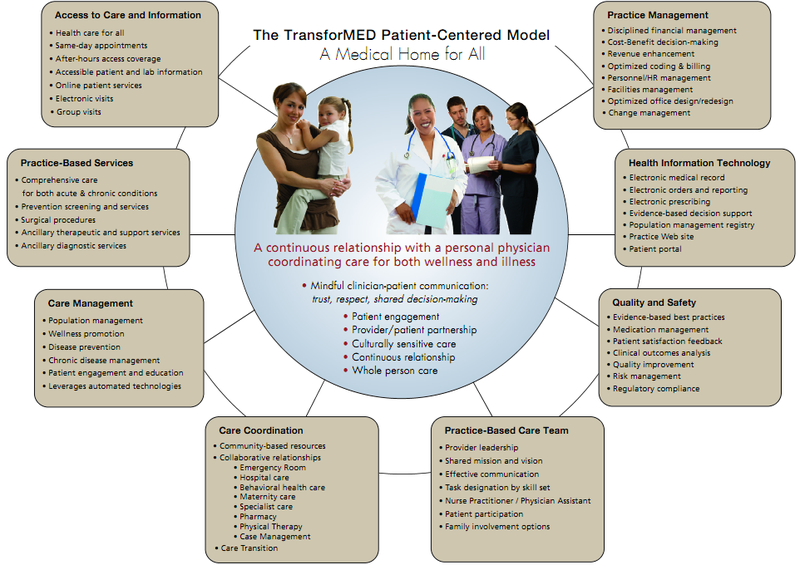 Whether it is the Patient Centered Medical Home (PCMH) or other care coordination and meaningful use programs, the focus is on building a relationship with a primary physician, improving access to that physician or clinic, and coordinating patient care more effectively. But there is really more to it than that. Patient-centered care is about the entire patient experience. It is designed to improve care and to reduce costs through a wide range of activities across your practice and throughout the healthcare system. As you can see in this graphic, a critical piece of the puzzle is improved practice management, billing and use of technology. Essentially, when you choose to participate in a model like this one you are optimizing your practice. Even if you aren’t ready to try to qualify as a PCMH, these strategies can help you improve care so that you can be more competitive in a healthcare market that is more driven be patient satisfaction than ever before. Improved patient engagement, access to medical records via a portal, more open information about cost, and electronic prescribing are just a few of the things patient say that they want. There are many strategies you can use to achieve these results. For some guidance on improving one or all of these areas, visit Kareo’s Resources page, which offers educational webinars, white papers and short videos on these and other topics. You can also register there for our upcoming webinar, The Patient-Centered Practice.